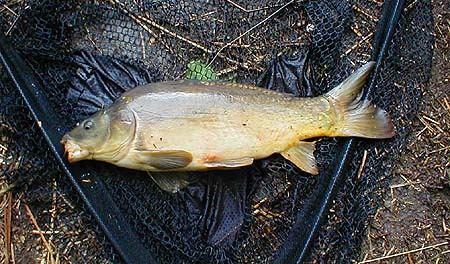 NOTICE THAT THE DATES ON EARLIER FRESHWATER PIECES DID NOT RELATE TO THE PREVIOUS WEEK'S FISHING - SUBSEQUENTLY THEY WILL. Sometimes I just feel like a change. 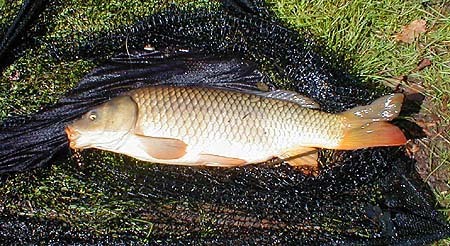 With the weather being mixed (to say the least) I decided to have a couple of carp fishing sessions. For various reasons I was only able to go in the afternoon - not ideal but there it is. I'm a great believer in keeping things simple so my rig usually consists of a hook tied direct to the end of the line and nothing else. My first session was a disaster. I fished a little bay surrounded by reeds (the big Phragmites with plumes of flowers and hard stems that rattle when the wind blows). The carp love these reeds and are constantly working through them. I chucked in a handful of Chum Mixer (softened by a quick soak followed by twelve hours in a damp poly bag) and waited. It was not long before the fish started mopping them up one or two at a time. When nearly all the handful had gone I lobbed a size 6 hook, baited with two mixers, to the edge of the reed bed. After two minutes it was taken and a huge fish (I hesitate to guess its weight) ploughed off through the reeds. It just kept going - further and further into the jungle and despite heavy pressure it was unstoppable. Eventually it threw the hook and escaped. I retrieved the gear fishless. (thats one of the nice things about simple tackle). Half-an-hour later another good fish (but nowhere near as big as the first) was hooked. This time I was ready for it and managed to hold it in more or less open water. It escaped after part straightening the hook. Two days later I tried again. Armed with some even stronger hooks, of the same size, I tried the same tactics. There was a bit of a breeze rippling the water and the fish were not so keen. After an hour I landed one 5kg fish and the others all disappeared so I decided to try another lake, a short walk away, which I had not fished before. As soon as I arrived I could see plumes of mud suggesting that the carp were digging about on the bottom. I only had the Mixers for bait so in went a handful. Immediately the fish began to pick them up but they refused the two on my hook for a good while. Eventually I hooked and landed a small (2.5kg) common from the sparse reed bed on my left. I returned home determined to try fishing on the bottom. The next afternoon I only had about an hour-and-a-half to fish. When I arrived at the spot where I had caught the smaller carp I threw in a few bits of luncheon meat and cast a cube into the same area. The rig was the same as the one for my Mixer fishing - just a hook! Nothing happened for an hour apart from one missed run and a few twitches. I decided to lob the cube of meat onto a shallow, bank lined with big reed mace plants. 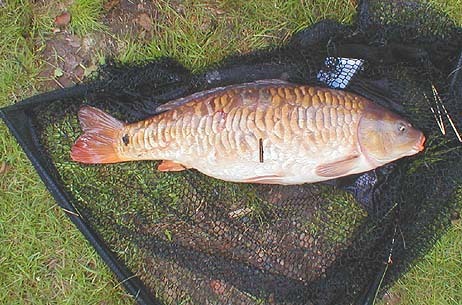 Almost at once I had a run and landed a decent carp with just a few scales along the ridge of its back. I was chuffed so I cast agin to the same area (about five yards to the right). I had a bite within five minutes and after a fairly poor fight landed a fully scaled mirror carp of over 9kg. It was a beautiful fish. I went home content that the simple approach still works and determined to come back for the big fish I had lost a few days earlier. At last I landed one!. The first fish on luncheon meat. 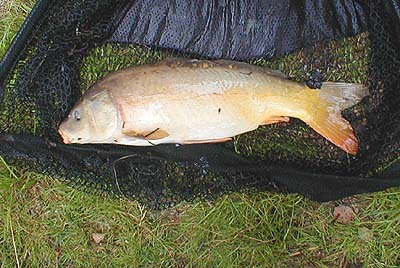 A wonderful fully scaled mirror carp.